Once off the radar (literally), the fairly secluded Okunoshima 大久野島, otherwise known as Usaghishimaうさぎ島 or Bunny Island, first gained Internet fame in 2014 when a video of a tourist swarmed by dozens of hungry, feral rabbits went viral. Read about the rest of my trip to Hiroshima and Kagawa! While Okunoshima’s rabbits are the main draw for majority of visitors today, the island once hid a dark secret from the world. Back in the days of the Sino-Japan wars, the government relegated Okunoshima as an off-site shore location for producing and storing poison gases such as mustard gas to be used against the Chinese. Thanks to her distance from Tokyo, the island – and her seedy operations – flew under the radar till the end of the war, when the toxic resources were disposed of and the facilities, destroyed. Today, visitors can explore the carefully maintained ruins from a distance, with an occasional rabbit wandering into the cordoned off premises (seems those keep out signs do not apply to rodents). Sites such as the Sangenya gas storehouse do appear imposing despite being long empty and overrun by wild foliage, making them a surreal sight in contrast with other holiday centric fixtures, namely a resort, camping ground, and tennis courts. 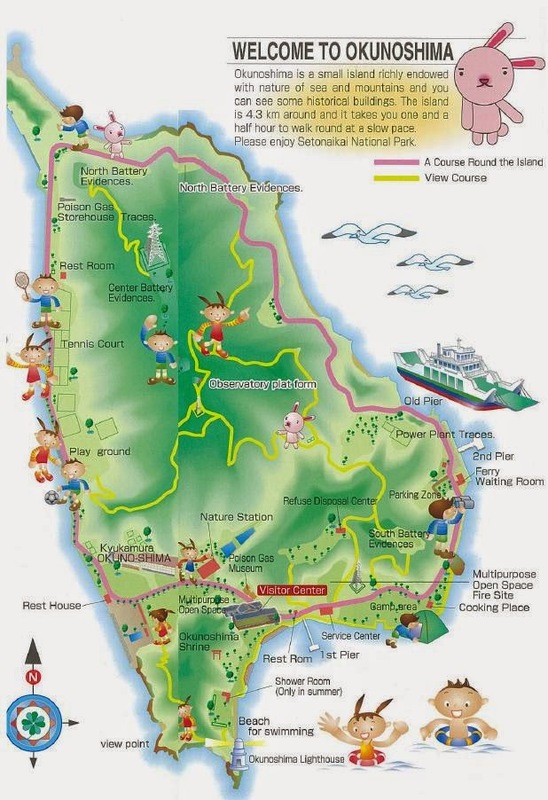 With most sightseeing and activity spots concentrated on one side of the island, you can easily access everything by foot, although a bike would certainly cut your commute by a fraction. Opening in 1988, the Poison Gas Museum, Okunoshima’s sole museum, summarises the devastating effects of poison gas production on former workers in a roomful of wartime relics and memorabilia. While majority of the displays are in Japanese, basic English translations are also available to explain their significance. As a small scale counterpart to the much more vividly detailed Hiroshima Peace Museum, the Poison Gas Museum stands as a locally funded reminder of the nation’s past dealings in World War II. While it’s not the first attraction most visitors make a beeline for, it’s definitely worth a visit if you’re on the island. While the production of poison gasses on Okunoshima Island have led many to believe the current rabbit population are descendants of former test subjects, no one really knows for sure how the rabbits came to be. Another explanation for their origins is from a class field trip that culminated in the release of a dozen pet rabbits on the island. One thing’s for sure, though: those rabbits sure are adorable and hungry. Most of them are concentrated around the port and the island’s sole hotel, so be prepared for more than a couple of rabbits to hop up to you in search of a treat, or even climb ever so delicately on your lap. One even hangrily scratched my hand to bring the food closer to its mouth! Pro tip: instead of pointing your camera straight on at them rabbits, place a handful of food pellets on the ground, place your camera at ground level, and wait for them to amble over. Instant photo moment! Your best bet for maximum rabbit exposure is before noon, when most are hungry and in search of food. The rabbits do seem to mellow around late afternoon, when most visitors head back to the mainland. Getting from Hiroshima, the nearest city to Okunoshima is a journey in and of itself. Tadanoumi Port, which you’ll arrive at after a half hour journey on the JR Kure Line from JR Mihara Station (on which you can enjoy uninterrupted views of the sea), is a pretty picturesque spot with its own quiet charm. 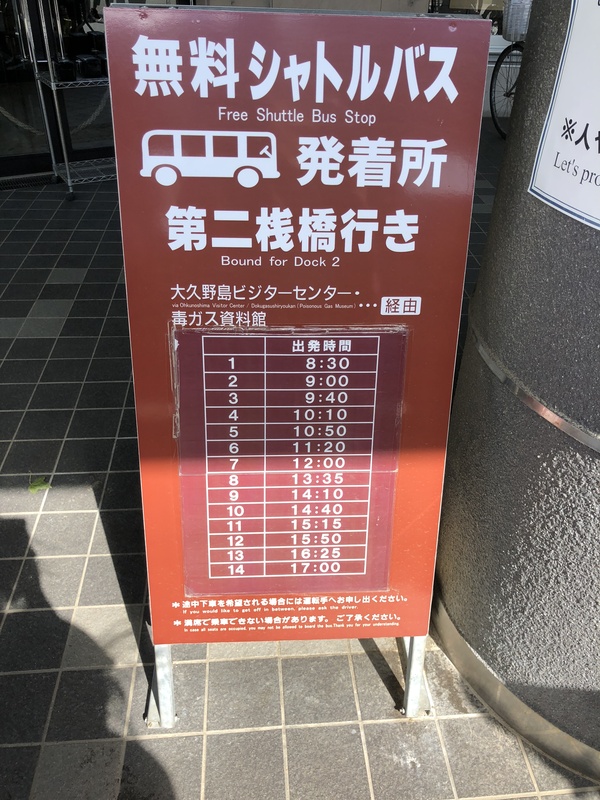 As the recent floods have affected part of the JR Kure Line, a replacement bus route is currently in operation. Not to worry; you’ll still enjoy the same views to and fro on the bus. Ferries run regularly from Tadanoumi, and take about 12 minutes to reach Okunoshima. Curiously, rabbit food is not available on Okunoshima. You can either buy pellets for ¥100 at Tadanoumi Port, or a cup of cut vegetables from the convenience store next door before boarding the ferry. Having spent the entire day on the island, I would say two bags are pretty sufficient. You can also exchange your empty food bag for a free rabbit postcard at Tadanoumi Port, so hold on to them! Tadanoumi Port store, located around the corner from Tadanoumi Station. While visitors are increasingly flocking to Okunoshima for a day’s escape from the city, tourist infrastructure on the island remains pretty basic compared to more popular spots like Miyajima and Naoshima – though that’s not necessarily a bad thing, given the tranquility (i.e. people free) that permeates Okunoshima. For now, overnight visitors can seek accommodation at the island’s only hotel and dining facility, Kyukamara Okunoshima. While the hotel is home to a cafeteria and mid end restaurant specialising in seafood, you might want to head there a bit earlier as some dishes are limited to ten servings per day, with lunch ending at 2.30pm. Otherwise, you can always grab a bento from Tadanoumi and enjoy your midday meal on the beach! The tranquility on Okunoshima was a nice change from the ol’ touristy hustle and bustle of Hiroshima City, and definitely worth checking out even if you are just looking for a change of pace mid holiday. If you have an extra day in Hiroshima and have a soft spot for feeding as many rabbits as possible, Okunoshima is the place to go.